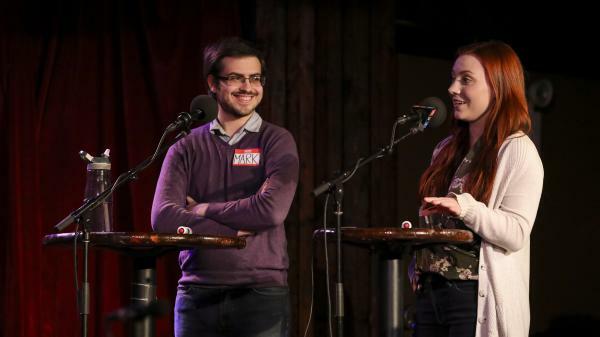 Contestants Mark Gartsbeyn and Elizabeth Foland appear on Ask Me Another at the Bell House in Brooklyn, New York. Don't know movies? You're what the French call, "Les Incompetents" (Home Alone, 1990). In this audio quiz, contestants listen to insults from movie dialogue and guess the film. Next, we'll play a game about movie insults. This is an audio quiz called Movie Stars, Verbal Spars. I'm going to play you the clip of a ridiculous insult. You identify the movie it comes from, and the points are doubled. Elizabeth, stay in the lead, you're in the final round. Mark, you need to get more points, or you get to leave early. EISENBERG: Here we go. Here's your first clip. This movie is from 1993. PATRICK RENNA: (As Ham Porter) You mix your Wheaties with your momma's toe jam. UNIDENTIFIED ACTORS: (As characters) Yeah. WIL HORNEFF: (As Philips) You bob for apples in the toilet, and you like it. GARTSBEYN: ...Small children being mean to each other. GARTSBEYN: Is it "The Goonies?" Oh, I'm so sorry. EISENBERG: Good guess. Elizabeth, can you steal? ELIZABETH FOLAND: Is it "The Sandlot"? EISENBERG: It is "The Sandlot." EISENBERG: This comedy is from 2011. KRISTEN WIIG: (As Annie) Whatever you say, Stove. MITCH SILPA: (As Flight Attendant Steve) It's Steve. WIIG: (As Annie) Stove - what kind of name is that? SILPA: (As Flight Attendant Steve) That's not a name. My name is Steve. WIIG: (As Annie) Are you an appliance? SILPA: (As Flight Attendant Steve) No, I'm a man. And my name is Steve. EISENBERG: Remember when "Bridesmaids" came out, and everyone was, like, oh, my God, it's a comedy with women? EISENBERG: Right? And now we have, like, three. EISENBERG: What 2003 film features this moment of self-deprecation? WILL FERRELL: (As Buddy) Why don't you just say it? I'm the worst toymaker in the world. I'm a cotton-headed ninny-muggins (ph). EISENBERG: This is your last clue. What movie is this insult from? FRANK MORGAN: (As the Wizard of Oz) You clinking, clanking, clattering collection of caliginous junk. EISENBERG: Anyone want to ring in, take a guess? Do you know what? Why don't we give you a hint? That insult was aimed at someone who had no heart. GARTSBEYN: It's got to be "The Wizard Of Oz." EISENBERG: After two games, Elizabeth is going to the Final Round. EISENBERG: Coming up, we'll find out who will face off against Elizabeth in our Final Round. And I'll talk to "Russian Doll's" Leslye Headland and Greta Lee about what it's like to say the same thing over and over and over again. Speaking of which, I'm Ophira Eisenberg, and this is ASK ME ANOTHER from NPR.